I have been teaching piano since 2008 and I have 100% pass rate for ABRSM, Trinity Exams, and Music Theory. Learn the songs/pieces you love at your own pace. I also highly experienced working with children with Dyslexia and Special Educational Needs. I am a Mobile Piano Teacher so you can have lessons in the comfort and convenience of your own home. My fee structure reflects this, as I charge £15 per 30 mins plus £5 travel costs. I believe that piano lessons should be fun and that a relaxed atmosphere is the best environment for effective learning. I only encourage students to take exams if they really want to and if they would rather learn to play their favourite songs I do what I can to accommodate this. My son is 3 and he has autism. He has had 2 lessons so far and he is thoroughly enjoying the time with the keyboard. He gets extremely excited when shes there and it is lovely to see. Angela doesnt judge you, ive found a lot of people can be discriminative against my son because of his autism. But Angela isnt like that. My son needs to gain trust before doing things other peoples way but every week hes been getting more interactive with Angela and also this week was copying certain things and allowing her to play at the same time . those are big steps for my son and I couldn't be prouder. Shes patient and caters for the needs of your child. Would highly recommend for people who have children with autism or other learning disabilities. Music is something that children with autism enjoy and sometimes people can shy away from doing something because of peoples reactions. Don't shy away because there are people like Angela who wouldn't judge and will help your child get an experience they have a right to enjoy. I was nervous that my son would.have a meltdown when she was packing the keyboard away but he didnt and he was happy enough and waved bye to her. She comes the same time each week which for my son is crucial as it has become part of his routine. Things have to be at their time. Watching my son jump around and smiling hands In the air before returning back to the keyboard to play some more is just very lovely to watch. Its like He's enjoying himself so much. My son loves music and dancing and I aim to give him what he likes to do. Just because he has autism doesn't mean he can't do something . I'm also starting lessons with her because I feel she's the right person to teach me as well as my son. Then I can learn things I can teach my son too. Or keep him entertained with those songs . I would recommend Angela to people who are nervous and for people who want their child to be relaxed and feel not pressured. She has worked with children with autism and also adults and thats why I recommend her for people who have special needs. There are not many pianists who work with people with autism so I was ecstatic finding one who was willing to teach and had the experience which I noticed on the profile. It will take time for my son to get used to her but that doesnt matter. Every week he gets more interactive. 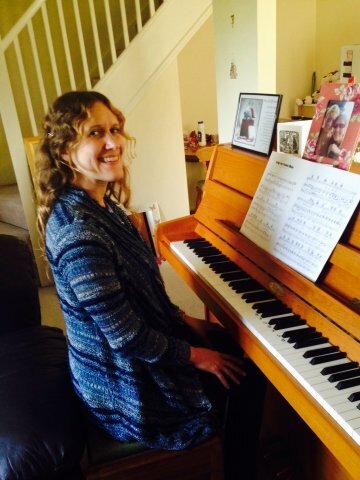 AngelaFrom Julie (5/5): Thank you Angela, you are a fantastic piano teacher for my 9 and 10 year old… they feel inspired and enthusiastic and it's wonderful to see such rapid progress so quickly. After only a couple of weeks they are playing some pieces and it's really impressive. AngelaFrom Brooke (5/5): Angela is a very patient and engaging piano teacher. Our 5-year-old son developed a love of piano with her - he would be so excited when she arrived at our house for lessons that he would drop whatever he was doing and head straight for the piano. He enjoyed his lessons so much that we tried to fit in as many per week as we could - up to 3, 1 hours lessons for a 5-year-old is a lot, but that is what he wanted to do! Angela created lessons which worked for our son, and that is why he enjoyed it so much. I'm really glad we found her and highly recommend her! AngelaFrom Lee-Anne (5/5): Angela is an excellent piano teacher for my daughter. She truly has brought out the best in her and makes each lesson so enjoyable. I couldn't recommend her more highly. AngelaFrom Roma (5/5): My daughter (who is on the autistic spectrum) started lessons with Angela a couple of months ago and enjoyed them very much. Angela was warm and patient in her approach to teaching her and quickly put my anxieties/concerns to rest. My daughter has benefitted from her time with Angela. I highly recommend her to parents with young children, particularly those on the spectrum.